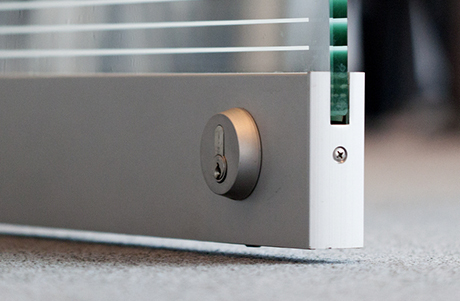 All folding panels are equipped with a quick release floor bolt with spring loaded security feature in the lower rail. 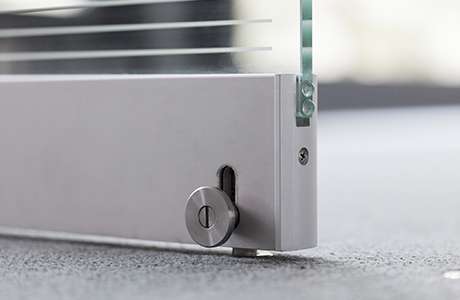 All swing panels and single/double action end panels are equipped with a quick release floor bolt with spring loaded security feature in the lower rail or an optional profile cylinder on the swing side of the system. 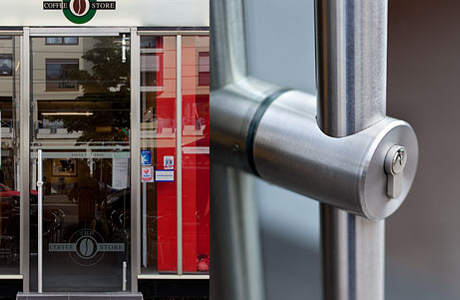 The Tubo100 brushed stainless steel finish handle/locking system that integrates a locking mechanism with a profile cylinder at hand height into the tubular designed handle eliminating the need to kneel to lock the door at the bottom rail. • A lever handle with deadbolt and a profile cylinder. • For additional security on swing panels and single/double action end panels, an optional crank handle operated surface mounted bolt can be added at the top rail. • If requested, NanaWall will prep the glass to accept locking options provided by others in order to match project specific designs.